Phoenix police arrested a man accused of armed robbery at multiple Valley gas stations. PHOENIX — A gun, a box cutter, and fists. 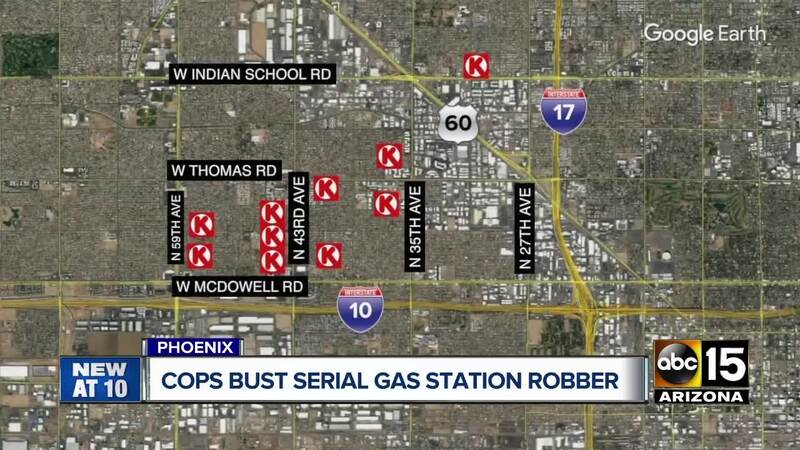 One man used all of them during ten separate Circle K robberies in just two months. Detectives arrested Vincent Ramos this week after his string of violent robberies all over the west Valley. Ramos would steal cash, cigarettes, and bus passes at all hours of the day, according to police. In one 24-hour period he robbed three Circle K’s. He’s charged with multiple counts of aggravated assault for punching store clerks and threatening them with weapons. Police also arrested his younger brother, Daniel Ramos, after one of the Circle K heists in November. According to court documents, the younger brother wouldn't tell police anything but a search of his family helped detectives determine their main suspect. Vincent kept on robbing, according to police. He hit five more stories even after his brother was locked up. Police say the two will now be reunited in the Maricopa County jail. The news is a relief to customers who said the robberies were unnerving. “I wouldn’t want to go there because then I am at potential risk of being robbed. I wouldn’t wanna go there,” said Robert Clark, a loyal Circle K customer. Investigators were not able to recover any of the cash stolen, but they did find a woman’s car that Ramos also stole. Detectives wrote in court documents that multiple store clerks identified Ramos in a photo lineup, and they also said they have DNA and fingerprints from different Circle K’s.